finish for heavily trafficked areas. The dexktect external park System is an integration of decktect base coat, decktect top coat and decktect aggregate holding coat. 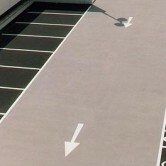 The Decktect PU Base Coat is used as part of the Decktect External Car Park System.